Biomechanics is the sport and orthopedic science field that applies the laws of mechanics and physics to human performance, in order to gain a greater understanding of both performance efficiency and injury mechanisms through experimental measurement, biomechanical modeling, and computer simulation. 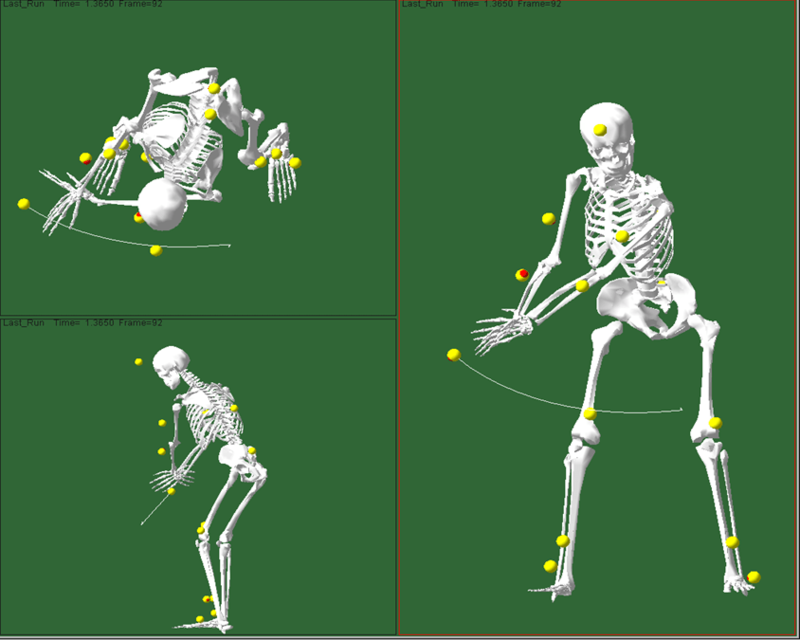 Performing simulated experiments on a virtual human or computer model is one of the most powerful methods to elucidate relationships between physiological structure and biomechanical performance. Simulation testing has been used in biomechanical evaluation studies investigating improved design of sports equipment and medical devices, injury analysis, response to mechanical or therapy interventions, theories of motor control, and surgical outcomes prediction. One of the major benefits of simulation testing is that questions can be studied that may be difficult or even impossible, costly, and/or unethical to answer through direct and repeated human subject testing. The simulation framework lends itself to predicting the effect of neural, muscular, or skeletal alterations on human performance. Simulation testing is a powerful tool to coordinate and facilitate the integration of many different kinds of biomechanical information. Models can be used to estimate performance under specific conditions or to assess how performance changes when specific factors are changed. Furthermore, simulation allows exact control over the characteristics of the test subject (i.e. the computer model) and the test conditions. The researcher can systematically change a single factor at a time through parametric analysis and identify factors critical to performance and injury risks. One of the main focus areas of my professional career has been dedicated to Biomechanical Evaluation Simulation Testing through advanced biomechanical modeling and analysis studies. My professional experiences have ranged from experimental methodologies for measuring and analyzing the kinematics of human motion, experimental measurement and mathematical calculations of forces, moments, and torques related to inverse dynamics techniques, and predictive biodynamic modeling and forward dynamics methodologies in the analysis and computer simulation of human movements. Armed with the very powerful systematic, vectorized approach of Kane’s Method, the ability to create biodynamic models that are ever more realistic and accurate in terms of their predictive power is easier than ever with modern day computational power in even desktop computers. Compared to using old classical methods for deriving dynamic equations, Kane’s methodology and the use of associated software programs give me the power to create extremely realistic biodynamic models in days as opposed to months. LifeMOD is another very powerful turnkey software solution that I have used in a number of different Virtual Product Development (VPD) programs.